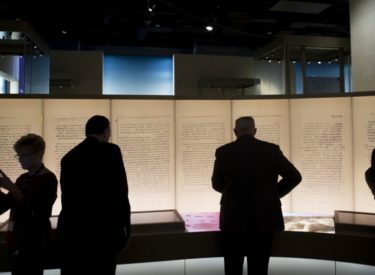 WASHINGTON (AP) – Less than a year after it opened, Washington’s Museum of the Bible is admitting that at least some items in its centerpiece collection of Dead Sea Scrolls are fakes. The embarrassing announcement Monday is the culmination of a technical analysis by a team of German scholars. They concluded that at least five of the museum’s 16 fragments are apparent forgeries. The authenticity of the collection was being questioned even as the $500 million museum held its grand opening ceremonies in November 2017. The scrolls are a collection of ancient Jewish religious texts first discovered in the mid-1940s in what is now Israel. Most are tightly controlled by the Israeli Antiquities Authority. But around 2002, a wave of new fragments began mysteriously appearing on the market, despite warnings from Biblical scholars. Among those eagerly buying up fragments was the Green family — evangelical Oklahoma billionaires who run the Hobby Lobby chain of craft stores.